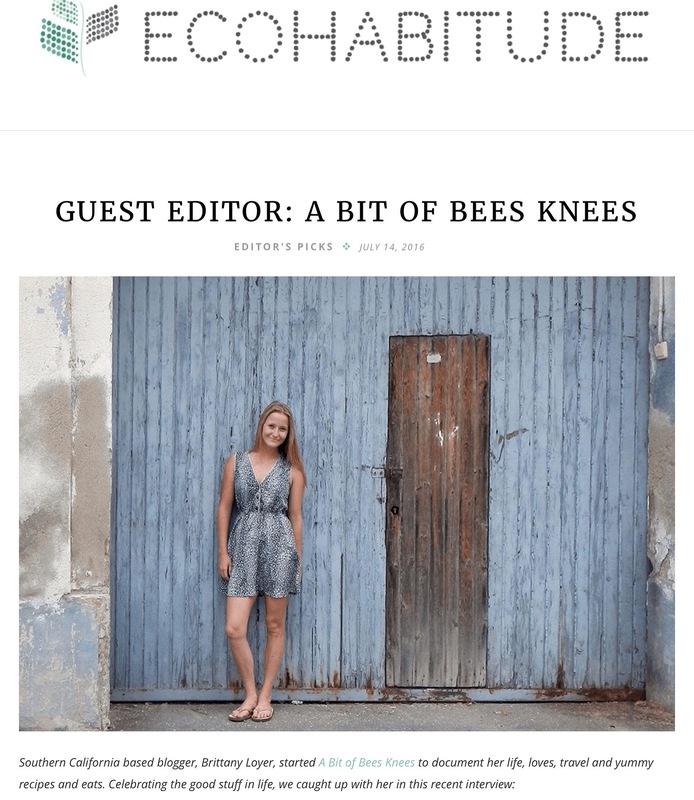 I’ve been working with the wonderful people at Ecohabitude for the past month as a guest pinner for their eco-friendly weddings board on Pinterest. Anna and Tatyana interviewed me for a little meet and greet for their website and blog. Head over to their website to find green, eco-friendly and socially responsible brands and products. They’re pretty awesome! Here is a copy of our fun interview and some links to my curating project highlighting a few of their fabulous products. How did you get into blogging and how do you pick your topics? I first started blogging as a way to share bits and pieces of my life, travel, projects and recipes – basically a journal of sorts where I could savor and celebrate all the good stuff that makes me smile. What tips do you have for someone who is trying to make lifestyle changes so that they are more socially conscious and eco-friendly? A few ideas you can start with are conserving water, driving less and walking more, turning off the lights when you leave the room, buying recycled products, eating locally grown produce, creating less waste, planting more trees, using less toxic chemicals etc. Live with a greater awareness of the resources that you use in your daily life. 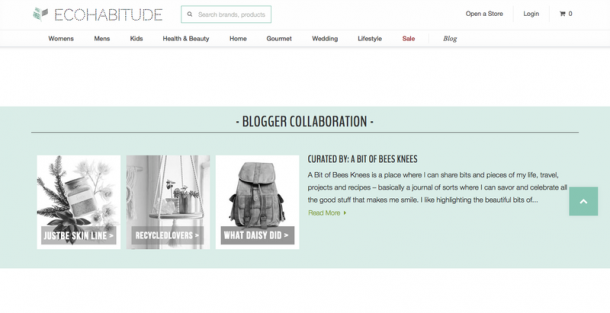 Shop for socially conscious products (here on Ecohabitude) and brands that are eco-friendly. Ultimately, when you are mindful about the way you live, everything will benefit from it. Just like “Everybody Wang Chung tonight!” what action would your name be if it were a verb? Hmmmm, it’s a bit difficult to describe myself as a verb, but I’ll take a crack at it. The verb “Create” is pretty accurate to who I am and what I love doing. Whether it’s creating memories, relationships, recipes or projects, I like to make things. The process of creating is beautiful to me. It’s my chance to leave a mark on this world when I create something. What’s currently at the top of your lust list and why? Ooooh a lust list! I have so many! Can I share a few? –Beech Backpack A British Association for Fair Trade shop, handmade, recycled leather (factory offcut) backpack that supplies 60 Indian families with jobs. All tailors are paid a fair commission and work from home. Compensation for their machinery, tools and electricity is provided. This company does not use any child, elderly or forced labor. ← I love knowing that the items I buy come from a company that treats their employees fairly and supports a community of craftsmen. This looks like the perfect backpack for more adventuring! Love those pockets! –Solid Shea Butter bars are so silky and moisturizing. I have dry skin so it’s important to keep moisturized. I like natural lotions and butters. “Whatever sits on your skin, gets in” so natural products are best. –Eno Hammock I’ve been drooling over this hammock for quite awhile. Light and compact enough for backpacking, it’s the ultimate access-pass to relaxation and has plenty of room for 2 and a tree-friendly hammock suspension system. I’d love to take this with me on our next camping trip. –Black Pepper Essential Oil spicy, warm and soothing! Black pepper essential oil also has a high concentration of minerals and vitamins (fabulous for cooking too). –Kai Perfume Oil an intoxicating scent of gardenia wrapped in white exotics made with essential oils in a convenient and easy to use roll-on vial. It’s paraben, sulfate, phthalate, phosphate, gluten and cruelty free! My go-to scent that I currently ran out of! It’s delicious! I get a compliment every time I wear it. Smells like a tropical rain forest in bloom! Traveling the world, as a photo journalist/chef sort of less-foul-mouthed Anthony Bourdain or Globe Trekker. I love learning about the world we live in, people, different cultures, relationships, food, ways of life etc. It all fascinates me! I think we have a lot to learn from each other. OK it’s a bit long, but stay with me…this one is so good. This entry was posted in Curating, Fashion, Home, Likes, Randoms, Style, Uncategorized and tagged collaboration, eco, interview, Review, Sponsor.